NEGRIL - The Captial of COOL! Not much compares with the COOL Vibe of Negril, Jamaica. Snorkel by the bay, explore the shore on horseback, or check out the scene on Seven Mile Beach. You just can't go wrong in Negril. Cliff diving, anyone? Sway to the soft sounds of Reggae, satisfy your hunger with some spicy Jerk Chicken washed down by a cool Red Stripe beer. Laid-back Negril offers the most amazing sunsets. Rick's Cafe long a popular spot to watch the sun drop into the Caribbean blue. A paradise for two people in love. 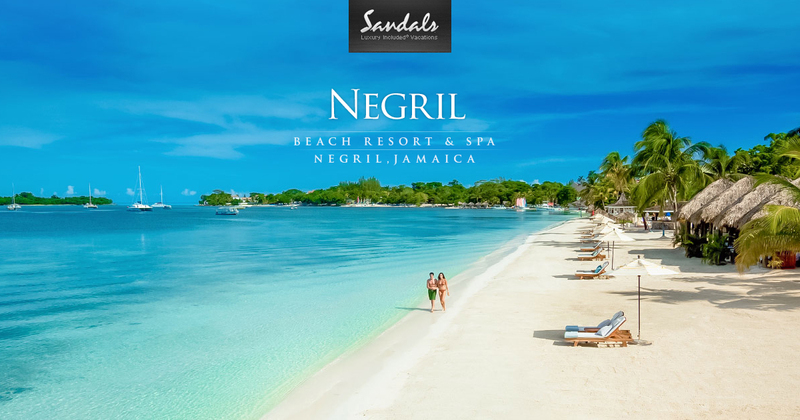 Sandals Negril offers the most magnificent lagoon suites located just meters from the soft white sand of Negril Beach. Two storey loft suites complete with your very own butler! 7 gourmet all included restaurants of which all with the exception of 1 are located beachfront. Now that's what I call a table with a view! Give us a call for more details about this exotic & chic resort. You will not be disappointed, "GUARANTEED"